Maincor are pleased to have partnered with Danish manufacturer LOGSTOR, to supply the Flextra range of pre-insulated pipes in the UK. The range includes both heating (PexFlextra) and hot water (SaniFlextra) pipe solutions. 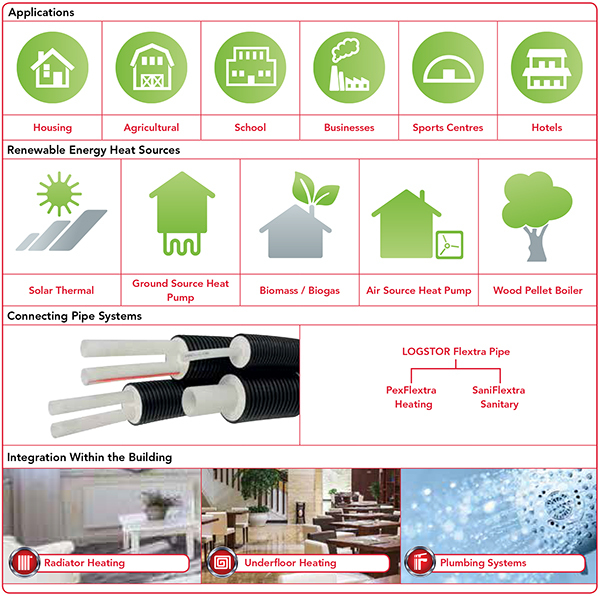 The systems are ideal for connecting buildings to external renewable heat sources such as heat pumps and biomass boilers. The extremely low heat loss of both types of Flextra pipe, means that hot water or heating water can be supplied into the buildings from the heat source maintaining the water temperature, ensuring a high level of energy efficiency, and saving money on running costs for the end user. Pipe is available in single or twin internal pipe configurations. The corrugated outer casing has a built-in LOGSTOR diffusion barrier (EVOH) to maintain the heat retention efficiency of the Flextra Pipe system throughout the entire service life. The product’s improved flexibility stems from a unique combination of the new corrugated outer casing and a newly formulated softer cellular insulation foam. Flextra Pipe is simple and fast to install making it ideal for use in projects with curves, or with a high number of obstacles on site. Flextra pipe is suitable for a wide range of building types including domestic and commercial projects in both new build and refurbishment applications. It can be installed with the minimum amount of disturbance to the local area – the small bend radius allows it to work around existing buildings and natural features, making it ideal for even the most congested of sites.